Book your cheap Aberdeen airport hotels with HolidayExtras.com® and you'll save yourself the hassle of an early morning journey to the airport. Our hotels combine great value with excellent facilities, so be sure to book in advance to guarantee the room of your choice and get the best deal. We offer two hotels at Aberdeen airport: the 3-star Britannia Aberdeen and the 4-star Thistle Aberdeen airport. They both offer fantastic value for money, and the Thistle provides a little added luxury if youre looking to start your holiday in style. Why book an Aberdeen airport hotel in advance with HolidayExtras.com? We're the UK market leader for airport hotels, and make arrangements for seven million people per year. When you book in advance with us, you could save up to 40 per cent on the price of an airport hotel, and all of our prices are protected by our Best Price Guarantee - if you find your Aberdeen airport hotel package cheaper elsewhere, well give it to you for free. 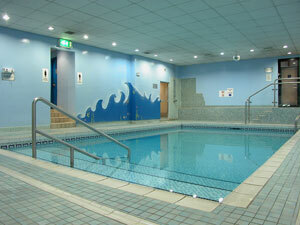 The Britannia Aberdeen boasts an indoor swimming pool, a sauna, a gym, and a bar and restaurant serving a selection of international and traditional Scottish cuisine. Your room will be en-suite and have satellite TV and a trouser press, with room service available 24 hours a day. The hotel is just ten minutes from the airport and serves breakfast from 5am, so its ideal if you've got an early flight. We also offer a parking package at the Britannia that includes up to 15 days' parking at the hotel. If you're on holiday for two weeks, you can book a room with parking - this can often work out cheaper than booking parking alone. What upgrades can I add to my Aberdeen airport hotel booking? We provide a fantastic range of upgrades to add to your Aberdeen airport hotel booking. Why not guarantee yourself a tasty meal and book dinner in the hotels restaurant? You'll save £2 per person on a two-course meal, or £3 per person on a three-course meal. You can also book a cot in your room for no extra charge. The FairFX card is a foreign currency card that works just like a debit card and means you don't have to carry cash abroad. The card is the safest and most efficient way to use money while youre away. The card normally costs £10, but when you buy it through HolidayExtras.com well top it up with £10 of your chosen currency to cover the cost. We also offer great value holiday insurance for everyone on your HolidayExtras.com booking for one fixed price, so the phrase 'the more the merrier' has never been more fitting! Our Traffic Assistant text service will send you traffic updates via text on the day of your journey to the hotel so that you can avoid any queues and plan alternative routes. This upgrade only costs £1, and will help you get to the airport feeling totally at ease.